Name: Why Normal Structure Matters. Are you tired of living with the same health issues that never seem to go away? Have you exhausted most forms of treatment and these conditions just keep coming back? Are you only ever finding temporary relief from things like headaches, dizziness, back & neck pain, fatigue, etc? 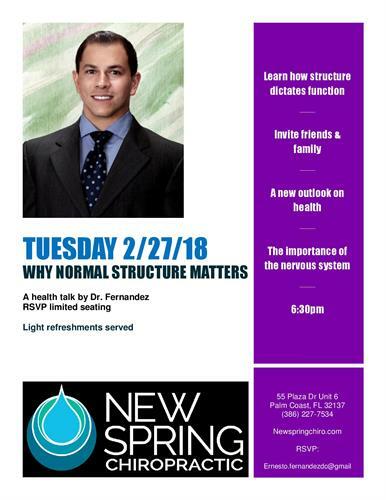 In this health talk, Dr. Fernandez will explain the difference in focusing on the cause instead of the secondary conditions and how this unique approach may be the missing link to a long term solution. Learn about the important role of the nervous system in regulating every function and aspect of your body and how your structural integrity dictates how well it works. Learn strategies to keep it free from interference in order to live a healthy and abundant life ! This may be a life changing seminar for you or someone you know! It is encouraged to bring friends and family.